About the author: Bob Stepno is a former mild-mannered reporter for The Hartford Courant, once a great metropolitan newspaper, if not quite The Daily Planet. From August 1999 to May 2013 he taught journalism, Web production and other media studies topics at Emerson College in Boston, the University of Tennessee in Knoxville, and Radford University, Radford, Va. He began describing himself as “semi-retired” in May 2013, while continuing to work on “Newspaper Heroes on the Air” and other writing projects. 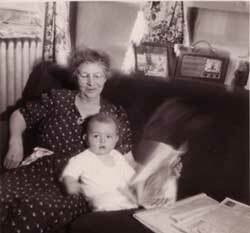 He began listening to the radio and reading the newspaper (sometimes at the same time) when he was very small. While television and the Internet cut into both his radio-listening and newspaper-reading over the years, he returned to old-time radio in the past decade, with help from podcasts. Around the time the picture at the right was taken, he remembers being frightened by a spooky voice chanting “Newww Bluuue Cheeer” on one of his grandmother’s soap operas. Maybe that’s why he went into journalism, not advertising. But he also remembers falling asleep to the suspenseful “The Shadow” and “Johnny Dollar” without being the least bit afraid, but without being inspired to become a mysterious avenger — or insurance investigator. The first fictional journalists he remembers encountering were on television, not radio: Clark Kent, Lois Lane, and a newspaper columnist condemned to write an “advice to the lovelorn” column on the TV series “Dear Phoebe.” His earliest recollection of a fictional work that convinced him that reporting could be fun and important (and that almost anyone could do it) was a movie titled “Francis Covers the Big Town.” His first bylined articles were on a high school Spanish club newspaper, El Corazon, mostly for awkward freshman-Spanish translations of items from a Radio Madrid shortwave-listeners newsletter. Stepno’s Other Journalism and Boblog blogs have taken a backseat to this one, but he still posts to them now and then — journalism and education notes in the first, and music-related items in the second. He also edits the AEJMC Newspaper Division blog and has home pages at Radford and at his stepno.com home. Great site, Bob. You are preserving history, one post at a time. Agreed, this is a great site! I’ve been going through some of your material on the New York Evening Graphic on one of your other webpages. I am trying to track down an original copy of Harry Grogin’s composograph, ‘‘Alice Disrobes in Court to Keep Her Husband,” published in the New York Evening Graphic on November 25, 1925 for a forthcoming publication. It seems like no public collection has editions of the Graphic from 1925 anymore, yet the image has been published in numerous books over the years without any citation. Based on your knowledge of the Graphic and its history, you might have advice on how to track down this particular image. Do you know of any major private collections of the Graphic, or even the location of an archive, that may include this particular edition?